Advance Registry Fix is an intelligent utility that interrogates your system for a wide range of PC problems, including references to already uninstalled programs, missing help files, broken shortcuts, virtual devices, start-up programs, fonts, and configuration files. Advanced Registry Fix checks & fixes all errors found in your Computer Registry that slow down and even crash your computer. It will even repair invalid entries at Windows startup. 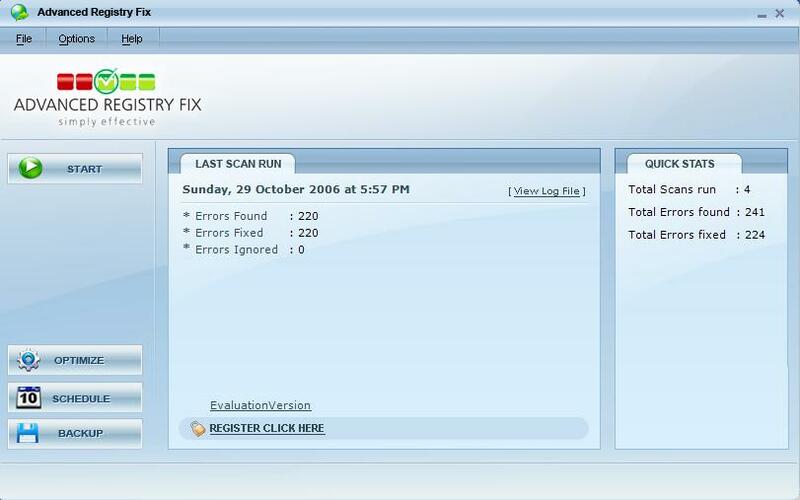 Advanced Registry Fix is an extremely easy to use tool designed to safely scan and repair Windows Registry problems with a few simple mouse clicks! Problems with the Windows registry are a common cause of Windows crashes, slow performance and error messages causing your PC to become unstable. 3. Interrogate your system for a wide range of problems, including references to already uninstalled programs, missing help files, broken shortcuts, virtual devices, start-up programs, fonts and configuration files. 4. Automatically and safely repair all invalid entries in your Windows Registry which can lead to Windows crashes. You can choose to selectively clean each item individually. Qweas is providing links to Advanced Registry Fix 4.0 as a courtesy, and makes no representations regarding Advanced Registry Fix or any other applications or any information related thereto. Any questions, complaints or claims regarding this application Advanced Registry Fix 4.0 must be directed to the appropriate software vendor. You may click the publisher link of Advanced Registry Fix on the top of this page to get more details about the vendor.